What do you really know about Canada? Canada, it’s just a country that borders us to the north, right? Well, did you know Canadians celebrate Thanksgiving too? Yeah, seriously they just celebrated it last week . So what do we actually know about Canada? I only knew the stereotypical anecdotes you all do. Canada is home to some crazy good maple syrup, has Niagara Falls, is pretty good at hockey and that they may even obsess over it a bit too much. I’ve always questioned why we haven’t been more influenced by the Canadians. We’ve had some major influences from Mexico; we’ve got a raging Tex-Mex scene on our hands everywhere. Think about it, there’s Chipotle and Taco Bell everywhere, but when was the last time you’ve seen a Tim Hortons? Canada needs to make its way across the border ASAP because it has some serious food chops. Here’s a brief introduction to what you can expect in Montreal. Montreal is seen by many as the foodie capital of Canada, and is a great place to visit for a multitude of other reasons. What follows is an ideal day for any foodie based on my own experiences. Think of this as a guide starting from sunup to sundown, from breakfast to the late-night munchies. If you thought New York was known for some incredible bagels you’re going to want to try the ones they have in Montreal. The city boasts a prominent Jewish community that can clearly be seen through the influences they have brought in the common delicatessen. One of these specialties is of course, the bagel. The Montreal product is a bit different than the one you’ll find in New York for several main differences. The main difference is that before the bagels are fired in a wood oven, they are boiled in a honey-sweetened water. This adds a sweetness that really sets the bagels from Montreal apart from those in New York. Additionally, the most traditional bagel in Montreal is covered in sesame seeds. 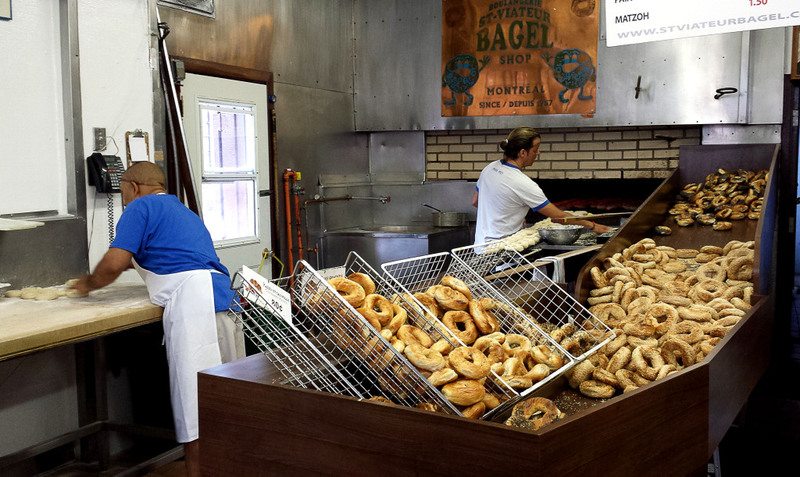 To find the best bagels, check out St-Viateur Bagel Shop. This is going to draw up the some more of that Jewish delicatessen influence I was talking about earlier. 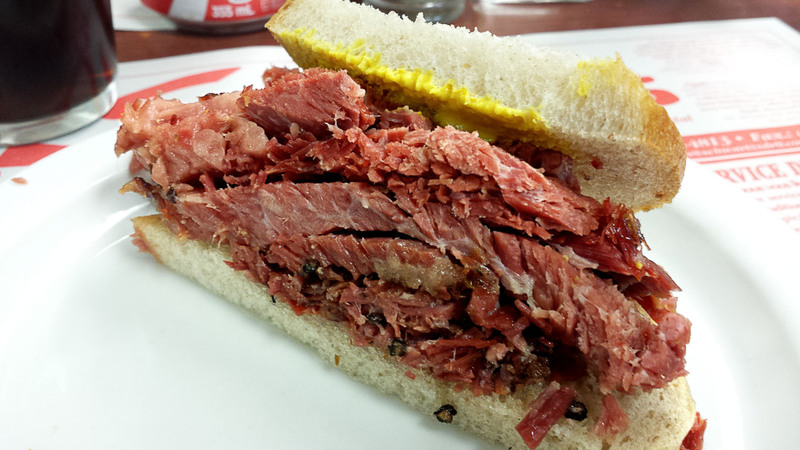 Smoked meat in many ways is closely related to pastrami. It’s similarly smoked and cured and uses the same beef brisket as pastrami. Served on sandwich bread and a healthy slathering of yellow mustard, this sandwich is a must try if you’re in Montreal. There’s only one place to truly get the authentic bite and that’s at Schwartz’s. Don’t forget to add a pickle alongside your smoked meat sandwich for the perfect compliment. Schwartz’s is basically the Canadian equivalent to New York’s Katz’s, both amazing and historical landmarks in their own right. Now that we’ve gotten your breakfast and lunch plans out of the way, we’ll get down to something a little more difficult to figure out because you’ve got a choice between two of the most popular establishments in Montreal. You could either go to Joe Beef or Au Pied de Cochon. These are essential food destinations that basically serve as the definition to what Montreal has to offer. For me Montreal is a city that’s doesn’t shy away from the use of fat and ingredients that most people would think to be too indulgent. It is what makes this city so great because while most restaurants will focus a dish on one decadent ingredient, Montreal will try to get as many as possible into a single dish that is cohesive and unbelievably delicious. Luckily for me I was there for more than a day so I didn’t have to decide. Based in technically sound French cooking, both restaurants serve as examples of how decadence is more than using heaping piles of butter. At Joe Beef, you’ll find an ever-changing menu that is written on chalkboards throughout the restaurant. 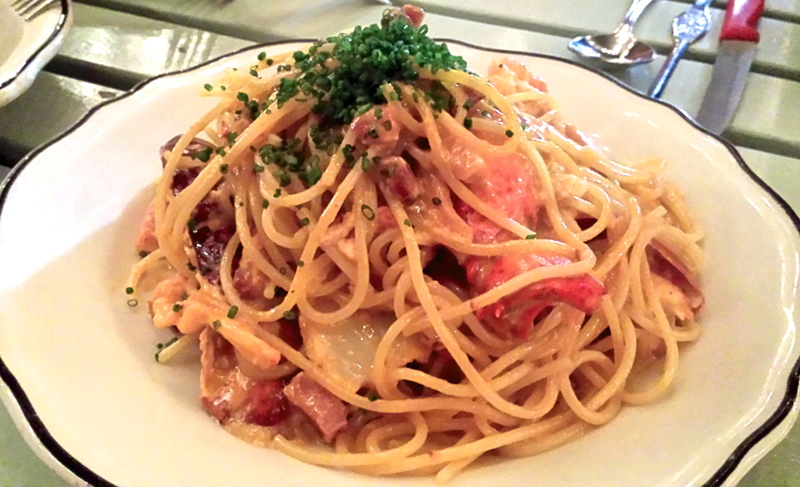 One of the dishes that can always be found here is the Lobster Spaghetti. Think lobster bisque, reduced and mounted with butter and then tossed in perfectly al dente spaghetti. This is not to mention the addition of a whole lobster poking out from underneath the golden bed of pasta. 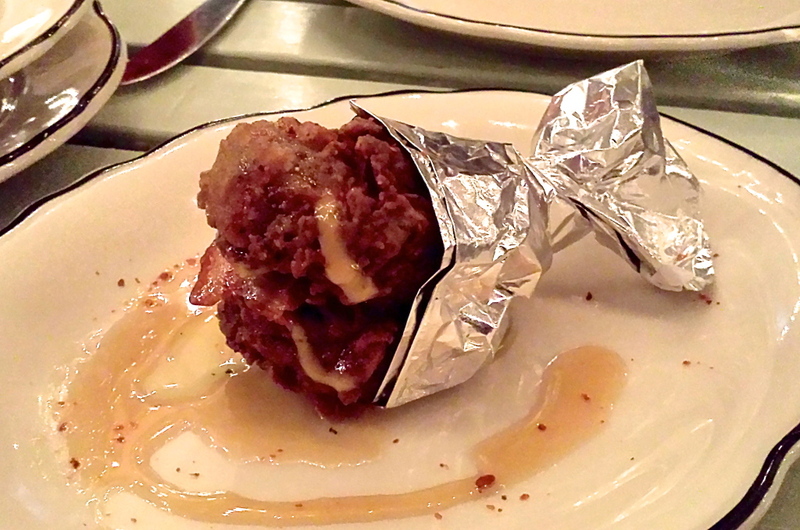 One well-known dish at Joe Beef is the foie gras double down, inspired by the KFC sandwich of the same name. They use two slabs of fried foie gras in place of the fried chicken. At Au Pied de Cochon you’ll find similar cuisine in that they don’t shy away from the bad, and when I say bad, I mean like you might get a heart attack before you can even pay the check, so really in my book that’s a plus. Simply put, Au Pied de Cochon translates to “pig’s leg” and that’s a specialty found there. If you’re not yet convinced just by the name, the menu has a section entirely dedicated to serving dishes with foie gras. So until you get to Montreal and try either of these establishments you’ll have to stay at home drooling over pics on Yelp! There is nothing more perfect for your late-night munchies than a plate of poutine. If there’s one thing that the U.S. needs to adopt from the Canadians, it’s this. After a night of beers and friends the next logical place is to go out and get your poutine fix. It is the quintessential food to seek out after a night of drinking. So what is it, exactly? Well, for the uninitiated, this is a plate of French fries topped with squeaky cheese curds and smothered in a luscious brown gravy, and that’s just the traditional version. 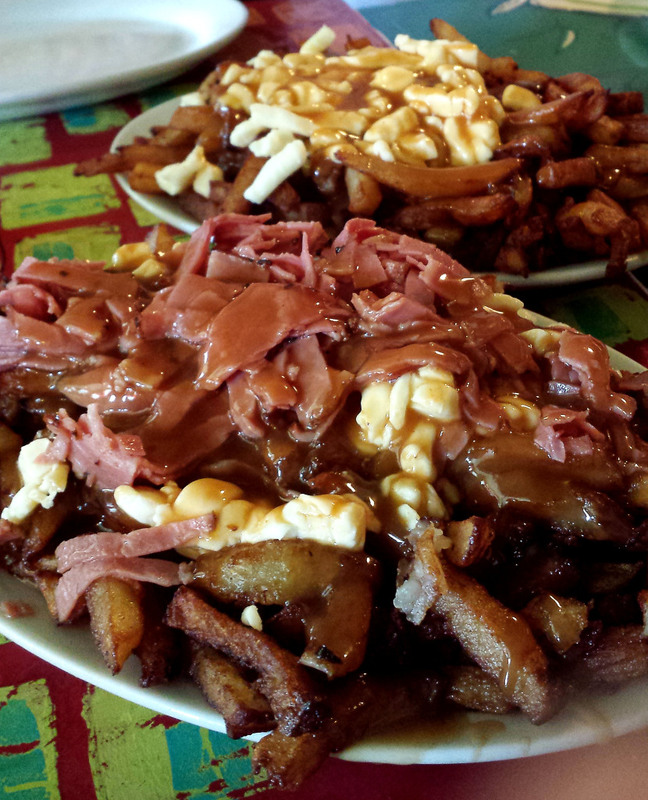 Just like how the American burger has many interpretations with various available toppings, poutine is similar in that one can top it with mounds of additional extras. Even though it’s found everywhere throughout Canada, the place to find the best poutine that will resonate with all Canadians is at La Banquise in Montreal. Open 24/7, it is the place to get your munchies fix on. There is nothing that compares to poutine for that final bite before crashing after a night out. It’s gluttony on a plate in its purest form – fried food smothered in cheese and gravy.